It won’t surprise anyone to hear how excited I was to find out I was going to receive some Fresh From the Factory (FFTF) Good & Plenty to review. Previously, we’ve sampled Fresh From The Factory Hershey’s Twizzlers and Fresh From The Factory Reese’s Peanut Butter Cups. As you know from reading Brian’s reviews, he wasn’t terribly impressed with the Peanut Butter Cups, and he was very happy with the Twizzlers. How would the Good & Plenty fare? I was, needless to say, giddy with excitement. I expected this Good & Plenty to be awesome. Finding edible Good & Plenty in stores is a bit hit and miss. I’d estimate my luck at finding edible (meaning, not so stale as to be impossible to chew) Good & Plenty to be about 50%. I assumed immediately that Fresh From the Factory would be the ultimate in soft, chewy goodness, superior to anything I’ve ever found in stores. Alas, I was somewhat disappointed. Oh, it was certainly fresh, but to be honest, I’ve had just as good in store-bought packages. If there was any difference in flavor at all, it would be that the FFTF had a bit more of an earthy, molasses flavor. However, any difference in taste is negligible. Ultimately, the decision to buy 4lbs of FFTF Good & Plenty may rest on your own success at finding fresh product in your local store. With this, you’re guaranteed some fresh, tasty licorice goodness, but you’ll pay a premium ($26 for the 4lb jar) for that privilege. 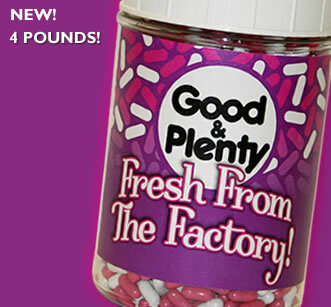 Please note that these candies are only available for limited periods of time; as of this writing, the Good & Plenty was scheduled to ship the week of June 18. Oh, i’m sorry that the fftf candy wasn’t a hit!! I would be really disappointed…i can only imagine how yummy good an plenty would taste fresh! That’s such a shame! I figured out of all the FFT andies, Good ‘n Plenty would be the best!